1898 saw another addition to Manor Court Road this time the baptist movement was helping the young people of Abbey Green area. On the 15th September 1897, the plans to build the New Baptist Church and Schools was given the go-ahead by the building committee. Designed by Mr John Wills, F.S.Sc from Derby, he outlined the plans to the Nuneaton Observer as follows - The Church had accommodation on the ground floor of 350 and the gallery 286 with 35 in the orchestra totaling 671. The schools would accommodate 350 scholars, 36 infants, 40 young men, 40 young women totaling 400. They had one assembly room, one lecture room, a room each for the young men and women, one infants and two class rooms, one vestry for choir, two vestries for ministers and deacons. The style of the building was early Gothic, the front of the church will be finished with a large window of considerate beauty and twelve windows along the side. The wall built using only the finest brick and detailed ornaments to give the building minimum exposure and likelihood of decay. Total cost of the project was £5000 and once again Mr Thomas Smith of Coton Road was contracted and the lucky pastor to oversee this great project was Rev J.R.Mitchell from Sheffield. 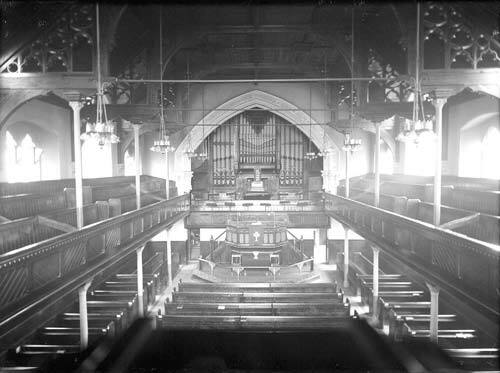 The inside of the Baptist church around 1900-1910 with the organ in a prime central position and an amazing amount of light coming in through the large windows. Reginald Stanley's stone at the Baptist Church laid September 1st 1898. below is a cavity with papers from the time. The stone-laying ceremony was performed on September 1st 1898 in weather of a genial autumn character. Flags and bunting waved above as the large party stood on Manor Court Road. A story was told about the humble begins of the Baptist Church in Nuneaton, It all started in Abbey Street from a wheelbarrow? Yes a wheelbarrow, then they managed to move into the 'Little Red House' on Abbey Green. 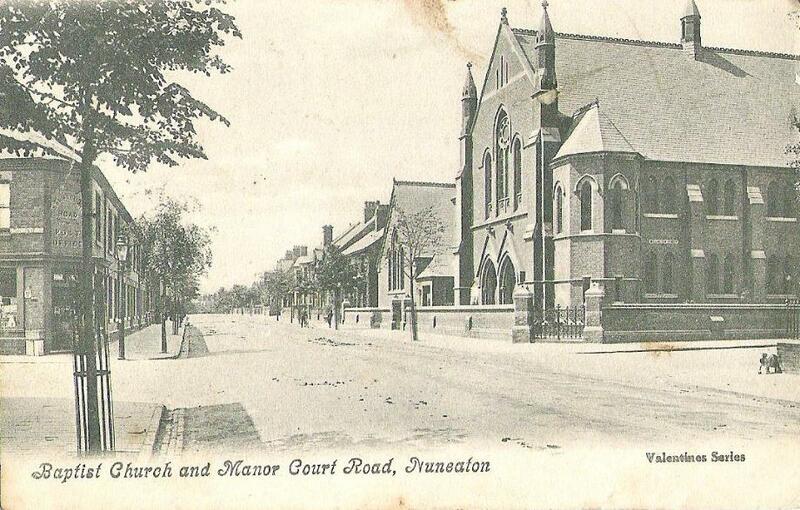 Over the next 40 or so year the congregation grew and they moved to accommodate this to 'Old Samaritans Chapel' on Midland Road and then the 'Gauze Hall' a former ribbon factory and then public house on the corner of Meadow Street and Abbey Street. The first stone was laid by Reginald Stanley (see above right), in a cavity below he placed local newspapers and circulars connected with the new structure. Eleven other stones were laid and each one presented with a bible suitably inscribed. Our friend Mr Stanley contributed another £200 towards the fund and £25 for his stone along with another £102 from the other stones made the total for the day £327. Later in the day there was a grand public tea and over 600 people attended. Thankfully this lovely church survived some very heavy bombing during World War two, which saw houses either side destroyed. If you've ever just wondered past and never stopped to look at this place, remember to stop and have a look at the stones by the door way and imagine the day the church was opened. Thanks for reading.